My first track day with the MR2 Spyder was a bit of a revelation. The car was very quick, but very prone to oversteer as well. It didn’t like any amount of steering under braking, and had to be under power while turning. Don’t get me wrong, it was fun, but not exactly confidence building. 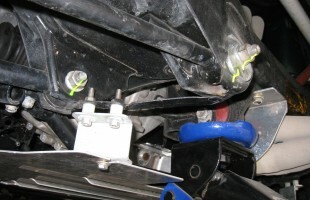 My original setup was a soft and street friendly 4kg/mm front spring rate and 6kg/mm rear spring rate. Even with the adjustable Whiteline anti-sway bars set full stiff up front and full soft out back, it wasn’t enough to tame it. The car gripped exceedingly well at the front, the new square 225 NT01s were definitely helping that. I needed a bit more front spring bias. Several track enthusiasts on Spyderhat were having good luck running stiffer springs in the front, so I decided to give it a go. 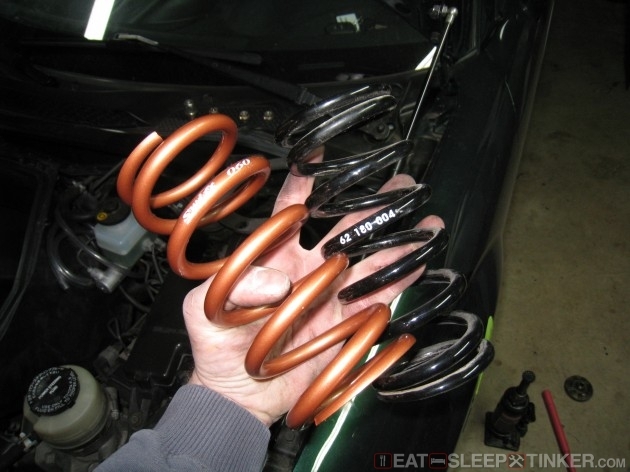 My BC coilovers will also take Swift brand springs, so I ordered a set of 6k and 7k springs. 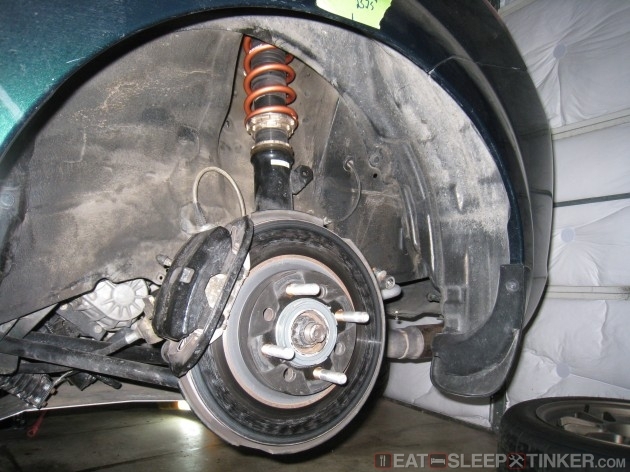 Normally you would have to completely remove the coilovers from the car to swap springs, but I figured I could save some time (and money in alignment) by doing it on the car, keeping the strut to knuckle bolts locked down. The front was very easy, as I just disconnected the sway bar, and dropped the coilover from the tower. The top nut holding the camber plate and top perch on the shock shaft was busted with my impact gun. 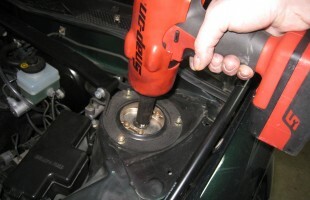 Then I just lifted the spring off through the large hole in the top of the shock tower. The new spring went on in reverse and everything was tightened down once more. 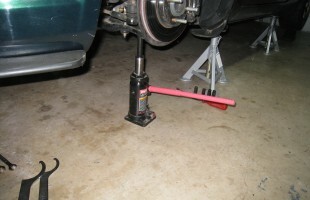 The small bottle jack was used to lower and raise the lower control arm while I was working. The rear was a bit more difficult, as the opening in the top of the strut tower is only large enough to allow the shock shaft and rebound adjuster to fit through, no way was I getting the spring in or out. So I dropped the spring perches as low as they would go and also screwed down the entire shock body as low as it would go. This gave me just barely enough clearance to finagle the spring out and over the shock rod. 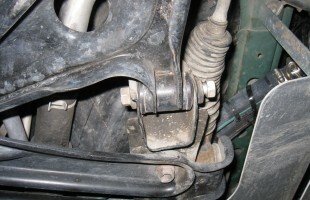 I also had to disconnect the trailing arms at the knuckle to allow the whole assembly to swing out far enough. While I was under the car, I found a big surprise; the front right lower control arm bolt had nearly backed its way completely out. The nut was hanging on by a few threads. Had this come completely off it would have been disastrous while under way. 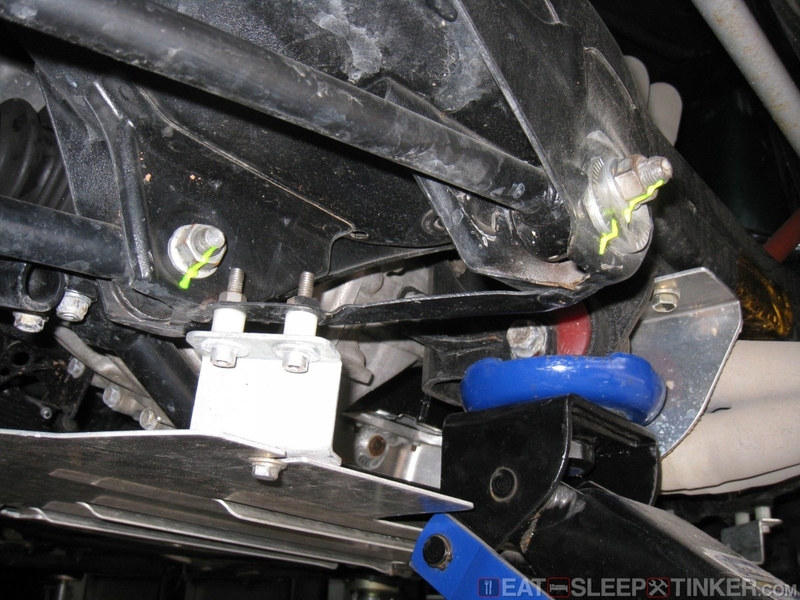 I ran the bolt back in, then proceeded to put a socket/wrench to every suspension component. Fortunately this was the only loose one. To help guard from any future loosening hardware, I marked every fastener with torque striping to aid in quick pre-track checks.